I his owl inhabits the cold forests and birch scrub of the far north. It has a round head with very large feather disks on each side of its face. The tops of these stand like bold, questioning eyebrows over the small eyes. The Great Gray Ow l looks sturdy but is in fact moderately sized and slender; its large appearance is created by a deep, dense layer of feathers extending to the toes and insulating it against cold weather. This species hunts both by day and by night, watching from a perch and swooping silently to seize prey. Sometimes it plunges through deep snow in pursuit of prey. It roosts in trees, perching close to the trunk. The diet consists mainly of small voles and mice, and also of shrews and small birds. • NEST An old nest of another large bird in a tree, particularly a conifer; or a hollow in a large, broken tree stump. Much of N. North America and across N. Eurasia. Some populations move south distribution irregularly in winter. With long, tapering wings, a long tail, and a low-crowned head, this species resembles a hawk or a falcon in outline. It is an active daytime hunter and often leans forward on a conspicuous perch to watch JUVF.NILE for prey. Flight is steady and direct, with short bursts of wingbeats alternating with glides, and quick turns of agility when catching small birds in the air. 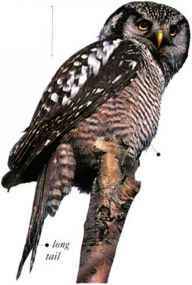 The Northern Hawk-Owl usually hunts from a perch, though it will sometimes patrol slowly overhead, hover, and then drop down onto prey. Voles are its majn prey, but it also takes some larger mammals. 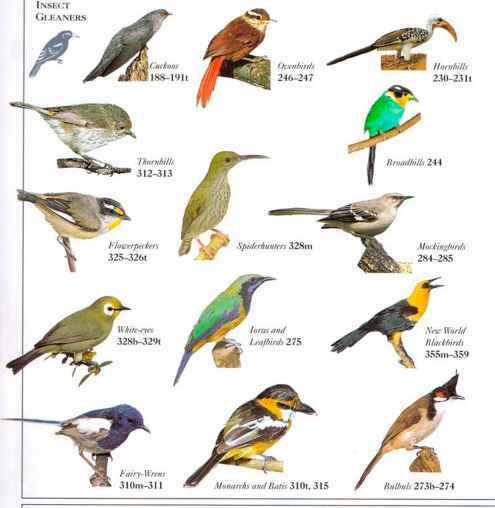 Birds are taken, and are an important item in the diet in winter when other food is scarce. They are sometimes seized in flight. This species utters a deep, rolling hoot and sharp, yelping calls. • NEST A hole in a tree, or the old nest of another bird. • DISTRIBUTION Much of N. North America and across N. Eurasia. Some birds move south in distribi tion winter within this range. 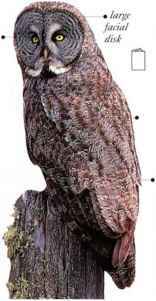 1 his small, compact owl has a broad head, round wings, a short tail, and feathered legs. The small, wide-set facial disks combined with the low forehead give the bird a scowling expression. An occupant of open places with some cover, it is found in a variety of habitats including farmland, parks, and stony plains. It is active by day as well as by night, and is able to walk, run, and hop. Alternating bursts of wingbeats and brief glides produce a distinctly undulating style of flight. 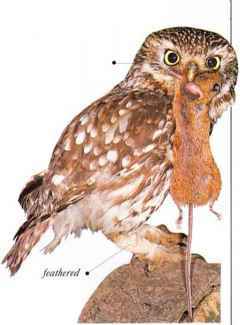 The Little Owl hunts by sight, taking insects, small mammals including rats, and small birds. • NKST A hole in a tree or rock face, a cranny in a barn or outbuilding, or a hollow in a rabbit burrow. ^ range from dark to light.